“It is the perfect end of summer bike tour! A ride fully supported with a great group of riders and with who has to be the best equipped mobile bike mechanic in Ohio. 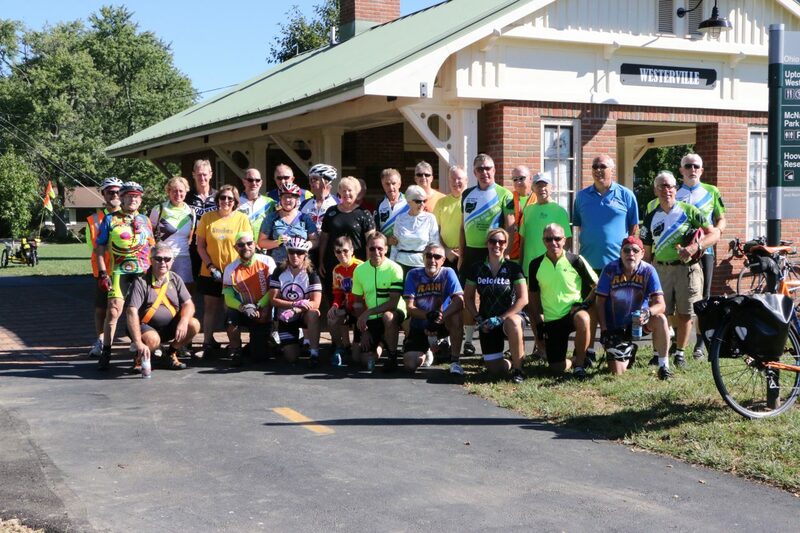 The 2015 tour was a fantastic experience!” says Terry Kassnel of Loveland after his ride with OTET this past September. 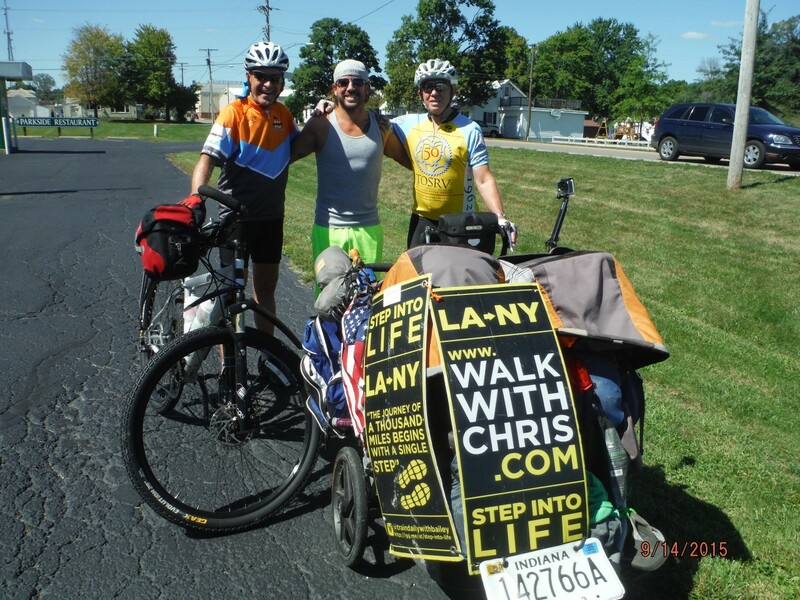 The six-day, five-night 2016 Ohio to Erie Trail bicycle ride from Cincinnati to Cleveland is set and we are now taking reservations at Ohio to Erie Trail 2016 Bike Adventure, 118 Graceland Blvd. #146, Columbus, Ohio 43214. Only 26-36 riders will be permitted to join this great adventure! Daily mileage ranges from 40 to 67 with nightly stays in Xenia, Columbus, Mt. Vernon, Millersburg, and Massillon. The entire 330 miles is fully supported with a luggage/bike vehicle, mechanic and OTET staffers. There is a cost range depending on when you register. Individuals will be responsible for making their own motel/hotel registrations at lodging facilities where OTET has reserved rooms at special rates. Food is paid for by individual participants as well. 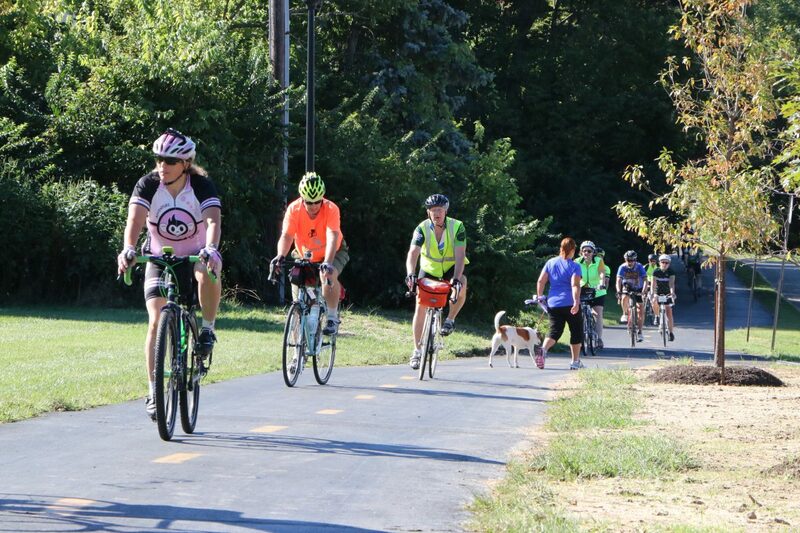 Several older sections of the OTET will have been paved and the route by next September will utilize the beautiful Alum Creek Trail on the east side of Columbus as well as a great new path to Glenmont in Holmes County! Some days are shorter than others and allow for bikers to either take a more leisurely ride, add miles on other trails to other places or spend time at sites along the way. A truly beautiful adventure has been planned. Trail surfaces are fine for road bikes, hybrids and mountain bikes. The OTET ride is considered a beginner to intermediate level adventure. While 90% of the trail is essentially flat, there are some hills along the way but none that are too long to just enjoy walking. Participants only need to carry what they will need for the day. Weather in September in Ohio is typically dry with temps ranging from morning lows of 45-55 to afternoons of 70-80…perfect for bike travel. Starting in downtown Cincinnati at Smale Park on the Ohio River, participants will depart for Xenia (67 miles) and stay at the Ramada Inn. Day 2 finds the group going to Columbus (60) for a night in the center of town at the Red Roof Inn. Day three we cross through Columbus to the Alum Creek Trail and end up 50 miles later in Mt. Vernon at the Holiday Inn Express. On day 3 we head for Amish Country to historic Millersburg (48) and the Comfort Inn. Day 5 we travel on to Massillon (40) for our shortest ride of the week and stay at the Hampton Inn. Day 6 is special. First we leave much earlier than the other 9 and 9:30 starts because there is an option at Akron (30 miles) to take a Cuyahoga Valley Scenic train ride ($3 bike and rider) to just outside of Cleveland. Riders need to catch the train at 10:45 a.m. Those who do ride the train have 10 miles remaining by bike after the train arrives in Independence. Participants who wish to bike the entire distance have 62 miles to Cleveland. Then we get to Lake Erie and peddle back to the Great Lakes Brewing Company for a late lunch before heading home. OTET will transport all bicycles and gear to either Columbus or Hamilton for pick up on Friday or Saturday after the ride. Hamilton is about 25 miles north of Cincinnati. Those who wish to obtain personal transportation to Columbus or Cincinnati might want to utilize the Megabus that departs from Cleveland (2 miles from Great Lakes Brewing Company) at 4:30 p.m. on September 15th. Fee to Columbus ranges around $15 and for Cincinnati $30. Reservations can be made 90 days prior to travel. Check web site for drop-off locations (www.megabus.com). There is room for only 20 participants on a first-come, first serve basis for this fund-raising event for OTET. The cost, payable by check to the Ohio to Erie Trail Fund includes a set of OTET Maps and varies by registration date: check received by January 1, 2016 – $400; check received by April 1, 2016 – $425; check received by June 1, 2016 – $450; check received by August 10 – $475. The OTETF has determined that the donation amount to the organization is the amount paid over $125 and each participant will received a donation statement. Up-date February 12, 2016 – Only a couple spots remain open but if interest continues AND we have room at the designated hotels/motels, we’ll allow up to 10 more participants on a first come first serve basis. Join now! Cancellation refunds up to July 1st will be made minus a $40 taxable donation. After July 1 the cancellation fee is an $80 taxable donation. We will establish a waiting list on first come basis for a $25 fee which will be fully refunded if the individual does not participate. If space comes available you will be notified immediately. 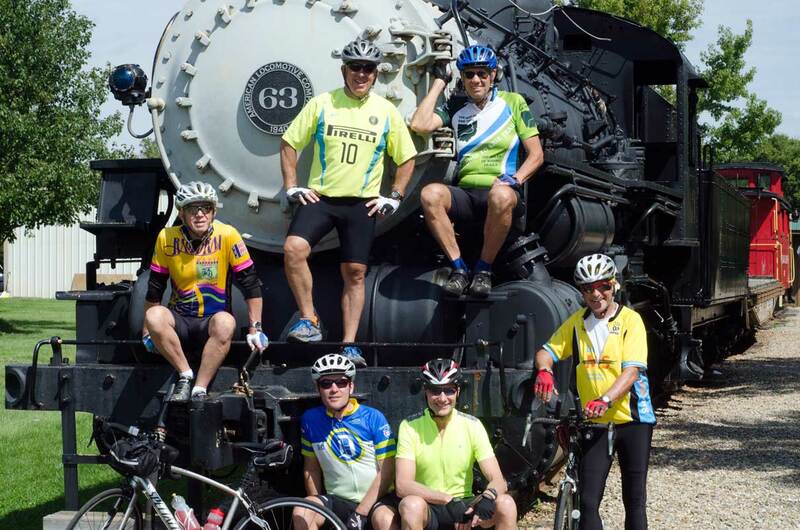 To join us in the exciting ride across Ohio send the following information and your check in the appropriate amount made out to the Ohio to Erie Trail Fund and send it to the address above in this article: name and full address; e-mail; telephone number(s) age; and type of bicycle. For more information contact Tom at MoffittOTET@gmail.com . See you on the OTET Adventure September 10-15, 2016!